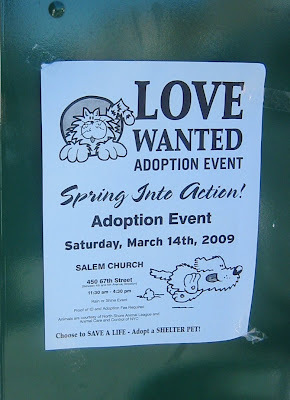 Salem Church, at 450 67th between 4th and 5th Avenues, is hosting the Love Wanted Adopt a Shelter Pet event tomorrow from 11:30 - 4:30. Considering the mild weather expected tomorrow, it would make a nice walk down to the northern-most reaches of Bay Ridge. Adoptable animals are from North Shore Animal League and Animal Care and Control of NYC. There is an adoption fee, and proof of identification is required.